Martin McCartin (treasurer Leitrim GAA County Board), John MacManus, Terence Boyle (Chairman) and Attracta O'Reilly (Secretary) pictured by Willie Donnellan at the presentation last Saturday. John McManus of MacManus Pharmacy, Manorhamilton made a presentation of an original letter written by 1916 leader Sean MacDiarmada to Leitrim GAA County board officials Martin McCartin (Treasurer), Terence Boyle (Chairman) and Attracta O'Reilly (Secretary) at half time during last Saturday's game between Leitrim and Monaghan in Pairc Sean MacDiarmada. The item was part of a rare book auction, organised by Fonsie Mealy Auctioneers, on December 5, 2017 in the Tara Towers Hotel, Dublin. Seán MacDiarmada is described as one of the main architects of the Rising of 1916. He, along with John Clarke - whose father hailed from Carrigallen, Co Leitrim - were instrumental in planning the Rising and also key in introducing the main players and bringing them together as a group during the 1915/16 period. 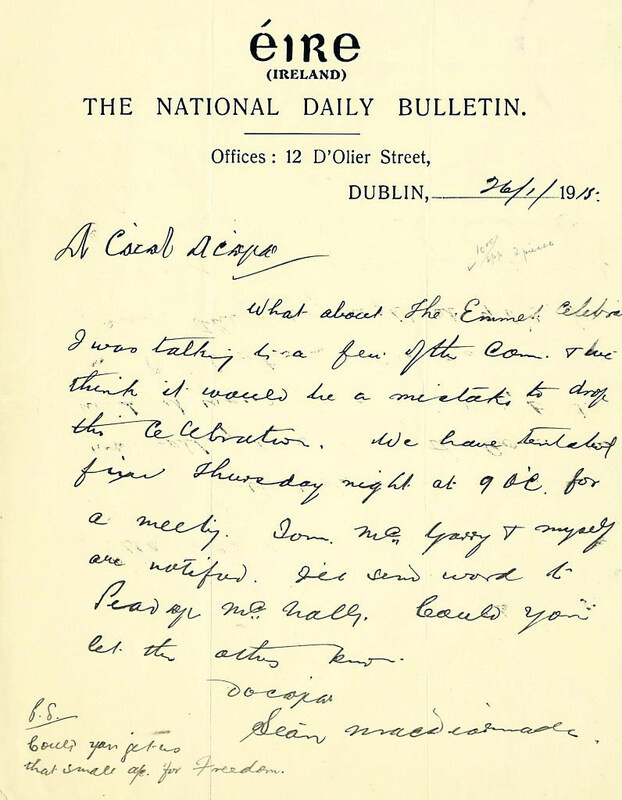 The letter is addressed to 'Cathal', (possibly Brugha) and is dated January 26, 1915. It is on a single page featuring the header The National Daily Bulletin - a Republican newsletter at the time. The letter speaks of plans for an Emmett celebration. "I was talking to a few of the Com[mittee] and we think it would be a mistake to drop the celebration", and proposing a meeting for Thursday night. "Tom [Clarke] (another 1916 Signatory with connections to Leitrim), [Seán] McGarry & myself are notified. I’ll send word to Peadar McNally. Could you let the others know". It is signed "Do chara / Seán MacDiarmada", and includes a postscript: "Could you get that small a/c. for [Irish] Freedom". Significant documents in MacDiarmada’s hand are now very scarce and this letter is believed to be of great historical significance. Speaking to the Leitrim Observer, after purchasing the historic document at last December's auction, John MacManus, said he has been collecting memorabilia linked to Seán MacDiarmada for over 10 years. “This letter could be very important because Seán MacDiarmada always wrote in code. While the letter talks about an Emmett celebration, it is very possible that this may be a coded letter. The rebellion didn't just happen overnight and this letter could be one of those blocks building towards the rebellion of 1916,” he pointed out. John's family has strong links with that of the 1916 signatory. When Sean MacDiaramada went to Belfast in the early 1900s he worked in John's Great Grand Uncle's pub for a time. “I am lucky enough to own some other items belonging to Seán MacDiarmada but this (letter) is very special as letters or any items linked with him are just so rare,” he said. “I think it is very important that we respect our history and it is vital for ourselves as a community to value our culture and heritage.